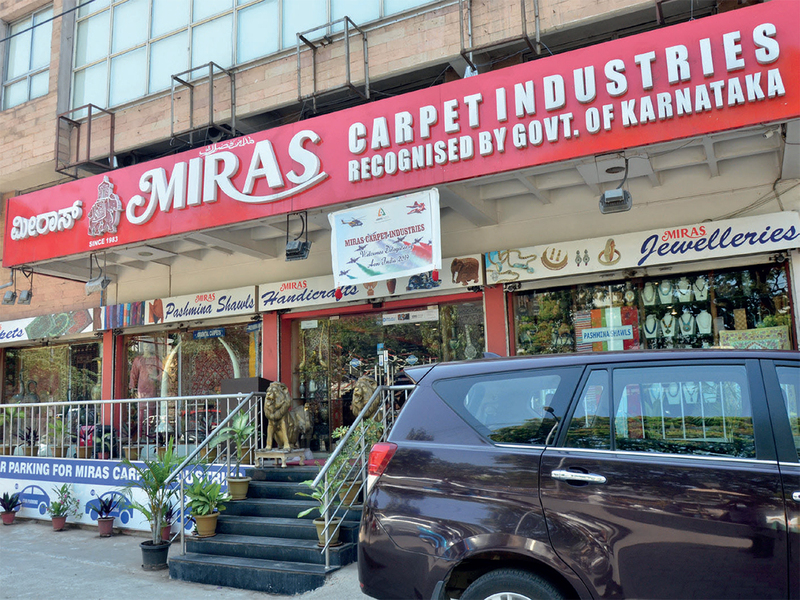 Miras Crafts is a sister concern and online business chain of ” Miras Carpet Industries” Miras Crafts is leading Floor Carpets and Rugs Manufacturers, Suppliers, Dealers in Bengaluru, Delhi, Mumbai & Kashmir, India. Miras Crafts is engaged in the business of Handmade Carpets, Rugs, Handicrafts, Pashmina Shawls, Cashmere Stoles, Women Stoles, Jewelry’s, Silks and other Heritage items of India and the Middle East Miras Carpet Industries was Initially established in 1983 as a recognized Manufacturing and export-trading house. Miras Crafts has successfully contributed to improving the Cottage and Village Industry in India and has helped Artisans and Master Craftsman to present their Art to international buyers worldwide. Miras Carpet Industries® is Basically Kashmir Oriented Company and the Factory is located in Lalbazar Srinagar Kashmir which is very Close To Bank Shores Of Nigeen Lake and Opposite to one of the Historic Islamic Shrine “Hazratbal Shrine “ Srinagar , Located in Central Kashmir, the city of Srinagar created Antique Carpets whose best Pieces are among the most important of the refined city carpets of the “Second Golden Age of Persian Weaving.” The Miras Carpet® rugs and Carpets of the 19thcentury and turn of the 20th century are the direct legacy of the first Golden Age of Persian Weaving, brought about by the artistic patronage of Great King Himayun, in the 16th and early 17th centuries. “The 18th century saw little if any production, but towards the end of the 19th century weaving was reintroduced to the city by merchants hoping to emulate the success of the newly established Tabriz workshops“(Middleton, Michael, Rugs & Carpets: Techniques, Traditions & Designs. Mitchell Beazley, London, 1996,). For example, the resplendent turn of the 20th century antique Miras carpet ® to the right features superlative workmanship and incredibly fine knotting. This stunning Miras rug has the distinctive attributes of Budgam, one of the city’s finest workshop, and is in magnificent, full pile condition. Enlivened by lustrous wool, its crisp, lyrical design, faithfully echoing the 16th century Safavid tradition, integrates an astounding amount of detail and myriad hues of color. This creates tremendous fluidity in both the field and border. The traditional brick red and blue palette is interpreted in alluringly soft values of muted brick and a tonal sapphire to azure range. Beyond the Indian shores, this concern for heritage is sustained by establishing ” Miras Crafts ” an opportunity not only to view and share the Indian heritage from the days gone by but also provide an opportunity to possess an unrivalled range of Carpets, Rugs of matchless excellence, extravagant Pashmina shawls, Cashmere Stoles, Scintillating Silk furnishing, golden and silver gilded artifacts, exquisite reproductions of Islamic art and miniatures. The list is as wide as the diversity on view. Miras Crafts stands on the strong foundation of highly skilled, dedicated crafts people. Its phenomenal growth can be attributed to these people and discerning tastes of its clients meticulous planning and gratifying results. Miras Crafts® mission has been to make available to the global visitor an unforgettable taste of the refined and culturally rich heritage of India. A unique organization that celebrates and nurtures the creativity of man, developed over millennia. At the centre of MCI’s Business Model are a hundred thousand craftsmen and their families who are guided, supervised and supported by infrastructure on a massive scale. The Journey of Miras Crafts so far has been truly inspirational led by our founders Mr. MIR NAWAZ AND Mr.MIR WASEEM. Boasting of an enviable dedicated clientele spread across the globe. Our Exclusive Showrooms are located in Bangalore / Mumbai / Delhi and Kashmir India, offering our customers an unmatched experience of exploring the Finest Kashmir Arts and Crafts to choose from. The Persian legacy to the world the shawl, has today metamorphosed into a fashion statement that has transcended the boundaries of fashion to claim a rightful place in textile history .Today, it is our proud privilege to present our collection of painstakingly crafted Handmade Carpets, shawls and scarves, to you, our valued customer. The Pashmina house trading llc with experience and research in revival, combined with constant updates in the world of international fashion. Our shawl collection incorporates several weaving and design elements including all sorts of Hand and machine embroidery. We possess an outstanding facility comprising of all requisite machines, looms and equipments to produce the world’s best range of products for our clients. We have in-house facilities for designing, production, finishing, quality control, Chold Labor & inspection, etc., that facilitate smooth and prompt production. Our large storage facilities and a wide distribution network provide us the capability to feed bulk demand in the shortest possible time frame. Certified Listed Dealers On Wikitravels.org. To ensure timely deliveries, we have our tie-ups with recognized clearing and forwarding agents, who take care of the shipment. Our association with major logistics players like Fedex and UPS services, etc. enables us to feed bulk demand within tight deadlines. Our products are a classic amalgamation of Kashmiri craftsmanship and modern trends. We are well supported by an expert team of designers, craftsmen, weavers, etc., which work round the clock to bring out the best in every item. We adhere to stringent quality control norms at every stage of our processes to ensure the production of only flawless items. Only the best grades of yarns, fabrics, silk and other raw materials are employed in these process, which are sourced from authentic vendors of the market. Every task is executed under the strict supervision of experienced craftsmen having extensive expertise in their respective discipline. Our entire collection is in tune with the international trends, focusing on intricate details, contemporary designs and mass appeal. Mission We are a prominent manufacturer, exporter and supplier of premium quality shawls, home furnishings and handcrafted items. Our wide assortment of products includes Kashmiri shawls, scarves, Pashmina shawls, stoles, jamawar shawls, mufflers, handmade carpets, home accents, etc. Our products reflect the modern sensibility with meticulous craftsmanship and vintage appeal. The rich revival of traditional aesthetics and treasured heirloom in our pashmina and jamawar collection, go well with the global fashion trends. Our shawls are not only stylish but also suit a wide variety of outfits, displaying elegance and beauty at the same time. Handmade Hand Knotted Silk and woolen Carpets and Rugs.